Haugland Brothers Carpet & Floor Care provides professional marble cleaning services to Hinsdale homes and businesses. 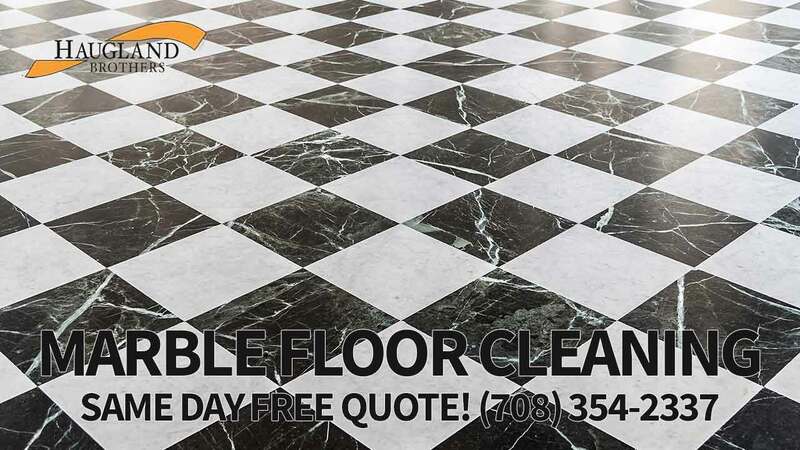 There is no marble cleaning job that is too small or too big for our team of expert floor cleaners! Our company services homes, offices, and businesses all over Hinsdale and surrounding communities. We have proudly been serving the Chicago area with our floor cleaning expertise for years, building a strong reputation that is founded on ethical business practices, high quality service, and value for the money. Hinsdale based Haugland Brothers Carpet & Floor Care brings that clean and shine you love back to your marble floor. We offer a number of different services, allowing you to pick the services needed to achieve the desired result. Your marble flooring is a big investment meant to add beauty and value to your Hinsdale home or business. Let that value sparkle with a professional cleaning by the Chicago experts. Marble is used by major institutions all across Hinsdale. We recognize the special needs of these buildings and have developed strategies that clean and shine your marble flooring quickly, allowing you to focus on the important services that you provide. Call us today and to bring brightness and sheen back to your marble flooring. We provide efficient on site floor cleaning services with top of the line products for competitive rates! Corner to Corner Shine in Every Chip! Your marble flooring is a mixture of marble and stone pieces that have been embedded inside of a concrete base. A popular flooring choice for larger institutions like schools and hospitals, these high traffic buildings quickly accumulate dirt and grime, taking the natural sheen away from marble floor. With the professional cleaning services that Haugland Brothers provides, every chip in the marble floor is brought back to shining beauty. Getting the Sparkle Back in Marble! Marble presents a unique challenge in that there is a protective coating that wears down over time. This coating not only keeps the stone chips from discoloration, it provides protection to the cement holding them in place. If not cleaned and resurfaced, the cement will become permanently stained, ruining the unique look of the marble floor. We not only deep clean and remove stains, we apply a protective coating that makes your marble floor sparkle. Why Should You Have Your Marble Floor Professionally Cleaned? Over time and through everyday use, the surface of marble will build up thin layers of dirt and grim, no matter how often they are mopped. If not removed professionally, that grease and grime will erode your terrazzo and cause permanent damage to the stone chips and concrete. The only way to prevent this is with the professional and thorough cleaning Haugland Brothers offers. A dull floor ruins the entire look and feel of a professional space. The first impression is altered tremendously when your flooring is sparkly fresh. Consistently keep that clean look by having your terrazzo floors cared for by our team. How Often Should You Have Your Marble Surfaces Professionally Cleaned? When and how often your marble flooring needs professional cleaning depends largely on the amount of traffic it sees. If your flooring appears dingy, even after a thorough mopping, it is time for a cleaning. Sand and salt from the Chicago winters will also cause the protective coat to break down faster. Always schedule a professional cleaning when the city thaws to remove those harmful particles and restore the floors protective coat before damage is done. What Can You Do to Protect Marble Between Professional Cleanings? For large institution spaces, frequent sweeping with a soft bristled broom will help in keeping sand particles from scratching at the surface. Mopping is also recommended using a mild soap solution that contains no harsh chemicals. You want to preserve the coating on your marble as much as possible to avoid permanent damage. How Important is Marble Protection? This is an important step in the professional cleaning of marble floor that cannot be skipped. The protective coating will reduce staining and preserve the integrity of the concrete. With the fast and efficient service that Haugland Brothers provides, the process will not cause any inconvenience to you or your business. Put the Sheen Back in Your Floor Today! Call Haugland Brothers Carpet & Floor Care today and create a path where every tiny marble chip of your floor shines through!